Post-radiation dedifferentiation of meningioma into osteosarcoma. A number of osteoblastic meningiomas, primary osteosarcomas of the meninges, and post-radiation osteosarcomas of the head have been reported. However, postradiation dedifferentiation of meningioma into osteosarcoma has not been reported previously. In 1987 a caucasian man, then 38 years old, presented with a pituitary macroadenoma. He underwent a subtotal resection of the tumor and did well until 1990 when a recurrent tumor was diagnosed. This was treated with subtotal resection of the tumor, followed by radiation therapy for six weeks to a total of 54 Gy. He was considered "disease-free" for nearly ten years. However, most recently in July 2000, he presented with a visual field deficit due to a second recurrence of his pituitary macroadenoma, now with suprasellar extension. At this time, as an incidental finding, a mass attached to the dura was noted in the left parietal hemisphere. This dura–based mass had grown rapidly by January 2001 and was excised. It showed histological, immunohistochemical, and electron microscopic features of malignant meningioma and osteosarcoma with a sharp demarcation between the two components. We report a rare case of a radiation induced dedifferentiation of meningioma into osteosarcoma, which has not been reported previously. Meningiomas are benign tumors of the meningothelial cells of the arachnoid. These tumors are usually attached to the dura and can be found along the external surface of the brain as well as within ventricular system, where they arise from the stromal arachnoid cells of the choroid plexus. Although intracranial tumors as a whole show a higher prevalence in males than in females, meningiomas have a 2:1 female-to-male ratio. Meningiomas are rare in children and even more rare in infants. They are usually solitary and their presence at multiple sites, especially in association with acoustic neuromas or glial tumors, suggests a diagnosis of type 2 neurofibromatosis. Several histological types are described. These include syncytial, fibroblastic, transitional, psammomatous, microcystic, papillary, glycogen-rich, cartilaginous, osteoblastic, and malignant . The wide spectrum of different types of meningiomas is most likely due to their dual epithelial and mesenchymal properties. Osteoblastic meningiomas, primary osteosarcomas of the meninges, and post-radiation osteosarcomas of the skull have been reported in past [2–8]. However, postradiation dedifferentiation of meningioma into osteosarcoma has not been reported previously. This 52-year-old white male was initially diagnosed with a pituitary macroadenoma at the age of 38 years in March 1987. He underwent a subtotal resection of this tumor via a trans-sphenoidal approach. In early 1990, he noted some light spots within his visual fields. Further testing showed bitemporal hemianopia. Imaging studies revealed a recurrence of his pituitary adenoma. At that time no dura based tumor was detectable. In May 1990, he was treated with subtotal resection of the tumor via a right frontal approach, followed by radiation therapy. The regimen consisted of 1.8 Gy in 30 fractions through 220 degree arc using 4 mV photons to a total dose of 54 Gy. The patient experiened progressive visual field deficit again in July 2000. Magnetic resonance imaging (MRI) scan of August 2000 revealed a 2 cm pituitary macroadenoma with suprasellar extension. At this time a small, dura based mass measuring 1.3 cm in greatest dimension was incidentally noted in the left parietal hemisphere (Fig. 1a). It did not involve the skull and was interpreted as meningioma. This dura – based mass was initially followed, but it demonstrated dramatic progression reaching to the size of 3.5 cm in the MRI scan of January 2001 (Fig. 1b). It was resected and submitted for histopathological evaluation. Following this resection, the patient received a second course of radiation therapy to the operative bed with a 2–3 cm margin. A total dose of 54 Gy in 27 fractions of 2 Gy was given. However, the tumor recurred after 8 months and patient succumbed to the disease 10 months after that recurrence. Autopsy was not performed. MRI of head. a: In August 2000 second recurrence of pituitary adenoma was detected with incidental 1.3 cm meningioma (arrow). B: By January 2001 the meningioma (arrow) grew rapidly and reached 3.5 cm in 5 months. Hematoxylin-eosin stained formalin-fixed paraffin-embeded tissue sections were studied by light microscopy. Immunohistochemical stains were performed on formalin-fixed paraffin-embedded tissue sections using streptavidin horseradish peroxidase method. The details of antibodies, clones, and pretreatments are shown in the Table 1. Appropriate positive and negative controls were set up at the same time. Immunohistochemical profile of both components of the tumor. 10 mM citrate buffer, pH6 for 30 min with 20 min cool down. *All antibodies were from Dako, Carpinteria, CA. Electron microscopy (EM) was performed by retrieving cores of tissue from respective areas of the tumor in the paraffin block. The cores were deparaffinized, hydrated, and brought to 0.1 M Cacodylate buffer followed by 1% Osmium tetraoxide. They were transferred through ascending grades of methanol to absolute methanol, followed by acetonitrile-epon sequence for final epon embedding and sectioning. Ultrathin sections were stained with lead citrate for electron microscopic examination after studying representative thick sections. The tumor resected in January 2001 was attached to a portion of the dura. It measured 3.5 × 3.5 × 1.5 cm and was ovoid, rubbery, with external bosselations. The cut surface was glistening gray white with focal areas of brown discoloration. Microscopy revealed two distinct histological patterns with sharp demarcation (Figure 2a). One area showed features of malignant meningioma with spindle cells arranged in whirls with foci of necrosis (Figure 2b). Nuclei showed moderate atypia with 13 mitotic figures per 10 high power fields (field diameter 0.35 mm). Numerous psammoma bodies were noted in a section from the peripheral area showing fibroblastic pattern with spindle cells and bland nuclei. Hematoxylin and eosin stained sections of the tumor. a. Meningioma component (1) was distinctly and sharply demarcated by prominent osteoid trabeculae (2) from the adjacent high grade osteosarcoma (3). b. Meningioma with intact whirling pattern. c. Osteosarcoma was high grade with pleomorphic nuclei and high mitotic rate with foci of fine osteoid (4), (a, b and c- H&E stain, a- X4, b and c- X10). Another area adjacent to the meningioma showed features of osteosarcoma with scattered osteoclast – type giant cells in the background of high grade spindle cells with clear to vacuolated eosinophilic cytoplasm (Figure 2c and 3) and 26 mitotic figures per 10 high power fields (Figure 3). These cells were arranged in short fascicles and were separated by numerous small caliber blood vessels and focal delicate intercellular osteoid trapping the tumor cells (Figure 2c). Some areas showed medium sized blood vessels with stag-horn pattern. Numerous scattered apoptotic bodies with focal large areas of necrosis were present. a. Higher magnification of osteosarcoma with numerous mitotic figures and ostoclastic giant cells. 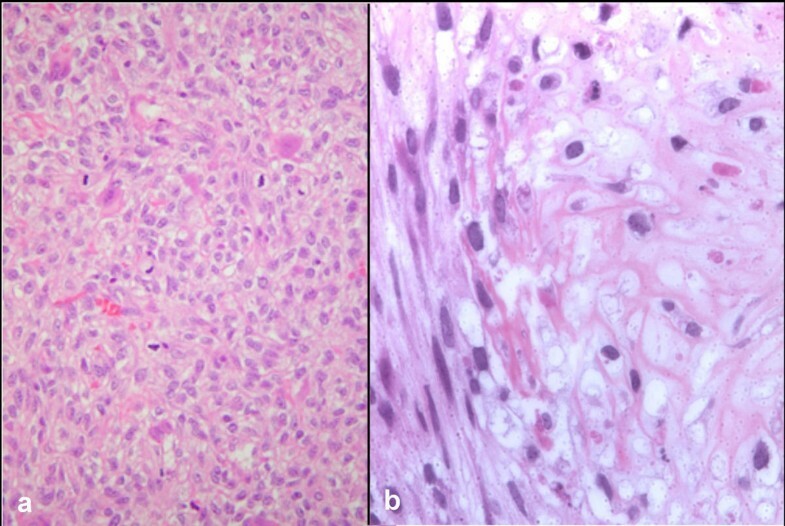 b. Osteosarcoma with areas of chondroblastic differentiation in the recurrence after 8 months (a and b- H&E stain, a- X20, b- X40). These two patterns were sharply demarcated with a distinct line of osteoid lamellae separating them (Figure 2a). The osteosarcoma component was surrounded by meningioma, which was seen as thin rim in some places at the periphery highlighted further in the section immunostained for S-100. The tumor cells in the meningioma component were immunoreactive for vimentin, EMA (Figure- 4a), and S-100 protein. They showed immunoreactivity for progesterone receptor in occasional nuclei and were non-immunoreactive for CD34, estrogen receptor, and cytokeratin AE1/AE3. The tumor cells in the osteosarcoma component were non-immunoreactive for all these immunomarkers, except vimentin (Table 1). Comparison of meningioma and osteosarcoma components of the tumor. Meningioma was immunoreactive for EMA (a), with none to scant reticulin (b), and low proliferative activity with few Ki-67 positive nuclei (c). Osteosarcoma was non-immunoreactive for EMA (x), with prominent reticulin around single cells and small groups of cells (y), and high proliferative activity with numerous Ki-67 positive nuclei (z). Reticulin stain showed a complex network around individual tumor cells and small groups of cells in the osteosarcoma, whereas it was sparse and present only in some areas interspersed between groups of tumor cells in the meningioma component (Figure- 4b &4y). Meningioma component showed 12% nuclei immunoreactive for Ki-67, as compared to 28% in the osteosarcoma component (Figure- 4c and 4z). CD34 highlighted the marked differences in the vascularity of the two components with mean vascular count of 3 vessels per 200 tumor cells in the meningioma component and 18 vessels per 200 tumor cells in the osteosarcoma component. EM confirmed the histological and immunohistochemical findings. EM of meningioma component showed characteristic features. The most prominent was interdigitation of adjacent cells often punctuated by desmosomes . EM of osteosarcoma component revealed matrix with scattered collagen fibers and focal calcium deposits . The second recurrence of the dedifferentiated meningioma, 8 months after the initial resection in Januaary 2001, showed the histomorphology of osteosarcoma similar to the first resection with added histomorphological spectrum of chondroblastic differentiation (Figure 3b). Meningiomas are usually benign tumors of pia-arachnoid and are generally seen in the 5th and 6th decades. Several etiologic factors, including ionizing radiation, head injury, hormones, genetic factors, and viruses are suggested in the literature [9, 11]. Osteosarcomas of the head have been associated with radiation therapy without any clear evidence of the relationship between the dose of radiation and rate of osteosarcomas [2–5, 7, 8]. Some authors regard primary osteosarcomas of meninges as a malignant counterpart of osteoblastic meningiomas . We present a case of postradiation dedifferentiation of a meningioma into osteosarcoma in a 52-year-old man treated with radiation therapy for recurrent pituitary adenoma 10 years before. The tumor was detected incidentally by MRI performed during the investigation for the second recurrence of the adenoma in August 2000 (Figure 1a). During the follow up, by January 2001, this tumor had dramatically progressed in size (Figure 1b). The ovoid tumor measured 3.5 cm and was attached to the dura. Histologically, it was remarkable with two distinct patterns. 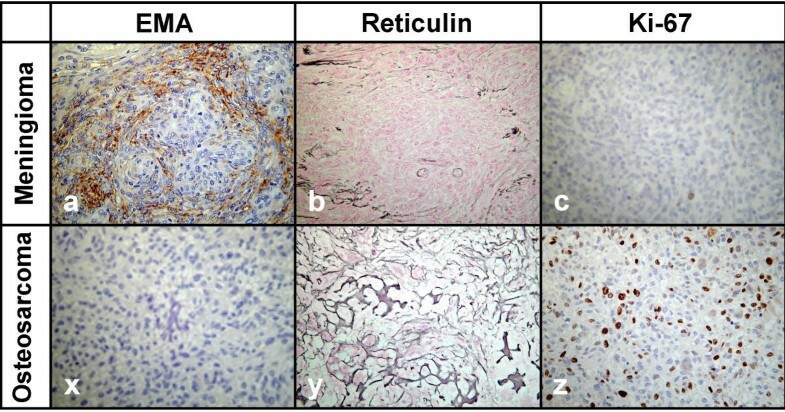 The histomorphology (Figure 2,3,4), ultrastructure, and immunoprofile of the tumor cells (Table 1, Figure 4a &4x,4c &4z) in these two areas were consistent with meningioma and osteosarcoma, respectively. The two areas were sharply demarcated by a well defined line composed of poorly formed osteoid trabeculae. The osteosarcoma component was entirely surrounded by meningioma component, which in some areas was reduced to a thin rim at the periphery. A sharp demarcation line between high grade (osteosarcoma) and low grade (meningioma) component was consistent with dedifferentiation . Postradiation dedifferentiation of a meningioma has not been reported previously, although postradiation sarcoma of skull following radiation therapy for partially resected meningioma has been reported . The time span reported in the literature between the radiation therapy and appearance of a post-radiation sarcoma varies from 5 years to decades. Chang et al  and Bernstein et al  have reported latency periods of 8 and 10 years, respectively. In this case, the time span between initial radiation therapy and emergence of meningioma with dedifferentiation into osteosarcoma was approximately 10 years. The tumor was not attached to the skull bones and recurred after 8 months. The recurrence demonstrated all the features of osteosarcoma along with additional histomorphological pattern of chondroblastic differentiation. The features considered to be helpful in categorizing this tumor as dedifferentiated, included sharp demarcation line, prominent variability in histological appearance, loss of surface markers, and high Ki-67 index. Based on the gross, histological, and immunophenotypic features, we interpreted this tumor as a rare case of postradiation dedifferentiation of meningioma into osteosarcoma. A rare possibility of collision of meningioma and osteosarcoma of meninges can be ruled out by the finding that osteosarcoma component was completely surrounded by meningioma component. Collision tumors are uncommon, and dedifferentiation is relatively common in many low grade tumors . In this case dedifferentiation is favored due to a distinct line of separation between meningioma (low grade component) and osteosarcoma (high grade component) showing high grade morphology with loss of immunoreactivity to various immunomarkers, high Ki-67 index, and increased mean vascular density (Figure 2,3,4). We report a rare case of dedifferentiated meningioma. The dedifferentiation appears to be secondary to radiation therapy for recurrent pituitary adenoma. Authors thank Scott D. Rand, MD, PhD for providing the radiographs. Our thanks to Gang Ning, MD, PhD and Mark Sadowski, PS for electron microscopy support. We also thank Sushrut Shidham and Robin Osipov for their secretarial help. Written consent was obtained from the patient's relative for publication of the details. 1. (VO) Collected all clinical data, participated in surgical pathology evaluation, and drafting of the manuscript. 2. (KH) Neuropathologist-Surgical pathology evaluation and reviewed the manuscript. 3. (HK) Neuro-oncologist of the case and reviewed the manuscript. 4. (GM) Neurosurgeon of the case and reviewed the manuscript. 5. (VS) Surgical pathology evaluation, conceptual organization, and manuscript writing.